Although I have written about Julius Schoenthal up to his death in 1919, I ended that post saying that I would return later to write about his children and other descendants. So here I am. Just to recap, Julius was the Schoenthal sibling who spent most of his years in the US in Washington, DC, as opposed to western Pennsylvania. He had served both in the German army and the US army, had worked as a shoemaker like his father Levi, and had had four children with his wife Minnie Dahl: Leo, Rosalia, Sylvester, and Moretta, all born between 1875 and 1879. His wife Minnie died in 1899. All of their children were married by 1905, and although the three sons remained in Washington, DC, Rosalia (called Rose) and her husband Joseph Pach settled in Uniontown, Alabama, where Julius died, presumably while visiting them, in 1919. I will discuss each child and his family separately beginning with 1920. Today I will discuss Leo and Rose; the next post will cover Sylvester and Moretta. 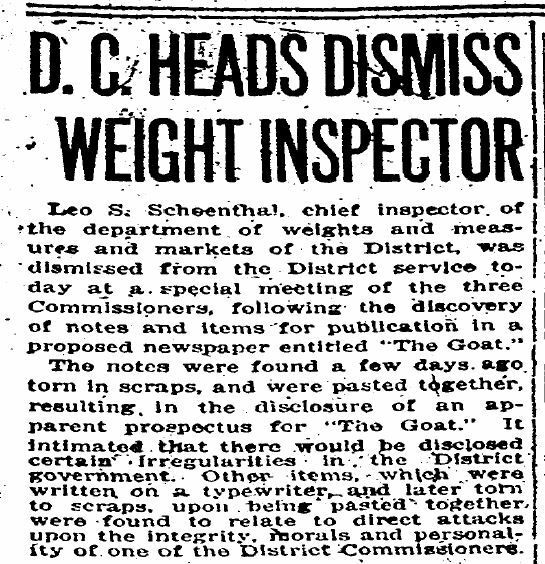 In 1920, Leo Schoenthal was working as the chief inspector for the DC Division of Weights and Measures, where he had been working for many years. He and his wife Fannie (nee Pach, sister of Joseph Pach, Rose’s husband) were living on Westminster Street in DC with their daughter Minnie (17) and five boarders. Leo’s long and distinguished career with the Division of Weights and Measures came to an unfortunate end in May 1922. According to the two news articles reprinted below, Leo had been disappointed when the Commissioner of the Division, James F. Oyster, had passed him over for a promotion to superintendent of the division. Leo himself admitted that he was dissatisfied with that decision. 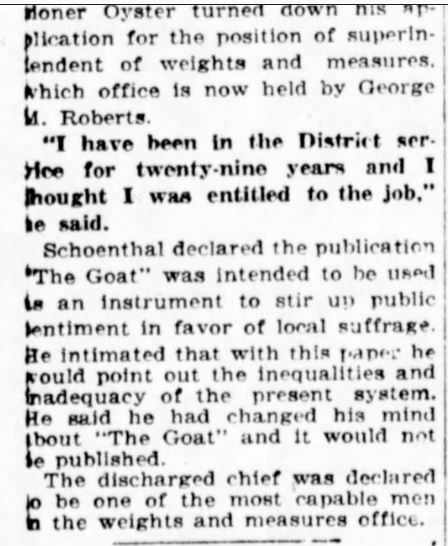 It then seems that Leo, who was planning to start a publication called The Goat allegedly to discuss suffrage issues, wrote a series of notes that made serious accusations regarding Commissioner Oyster; the content of those notes was not revealed in either of the news articles although apparently they included attacks on his “integrity, morals, and personality” as well as charges of irregularities in the operations of the office. The notes were found torn into pieces in Leo’s trash basket in his office, and although he claimed that he never intended to publish them, he was dismissed from his position. Leo also said that he had planned to resign his position anyway after he had been passed over for the superintendent’s position. Thus, after 29 years with the Division, Leo was fired seemingly without much opportunity to defend himself. The article from the Washington Times ended with these words: “The discharged chief was declared to be one of the most capable men in the weights and measures office.” What a sad way for Leo to end such a distinguished tenure in that office. But Leo apparently bounced back. In the 1923 directory for Washington, DC, Leo listed his occupation as “Westminster Press.” Although I cannot find any specific information about this business, I assume it was a printing business owned and managed by Leo, based on information from the obituaries of both Leo and his wife Fannie (see below). I also assume they named it for the street where many of the Schoenthals had once lived in Washington, including Hilda, their cousin, daughter of Henry Schoenthal. 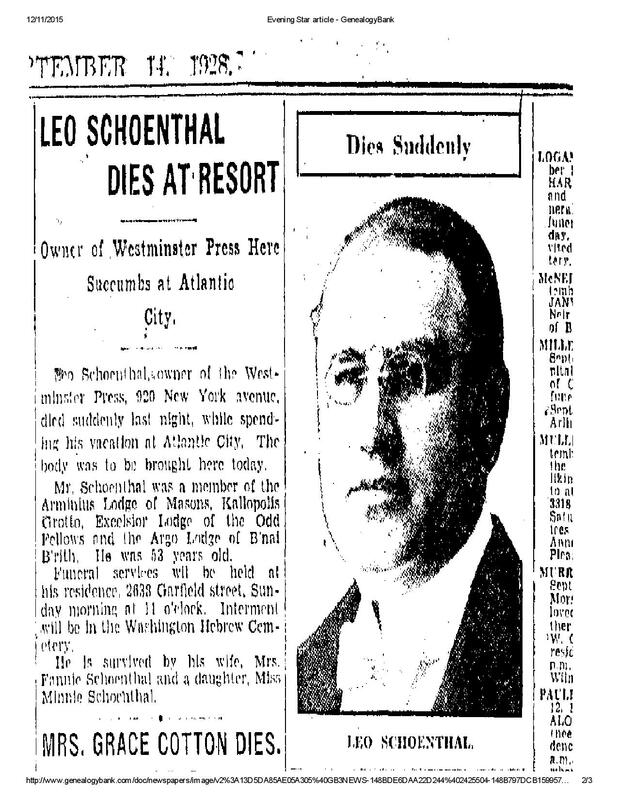 Five years later on September 13, 1928, when he was just 53 years old, Leo Schoenthal died suddenly while on vacation at a resort in Atlantic City. He was buried at Washington Hebrew Cemetery. In his will, Leo left his estate to his wife Fannie. Ancestry.com. 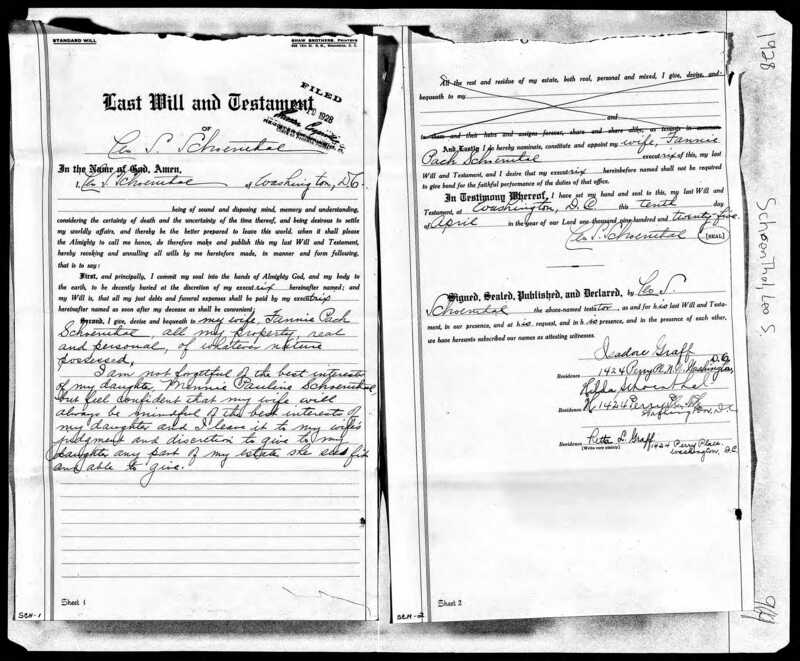 Washington, D.C., Wills and Probate Records, 1737-1952 [database on-line]. Provo, UT, USA: Ancestry.com Operations, Inc., 2015. I give, devise, and bequest to my wife, Fannie Pach Schoenthal, all my property, real and personal, of whatever nature possessed. I am not forgetful of the best interests of my daughter, Minnie Pauline Schoenthal, but feel confident that my wife will always be mindful of the best interests of my daughter, and I leave it to my wife’s judgment and discretion to give to my daughter any part of my estate she sees fit and able to give. Three months later on December 2, 1928, the Washington Evening Star announced Minnie’s engagement to Myron Hess, the son of Fred and Marcianna Hess of Atlantic City. According to the 1920 census, Myron was then working in his father’s photography business in Atlantic City. 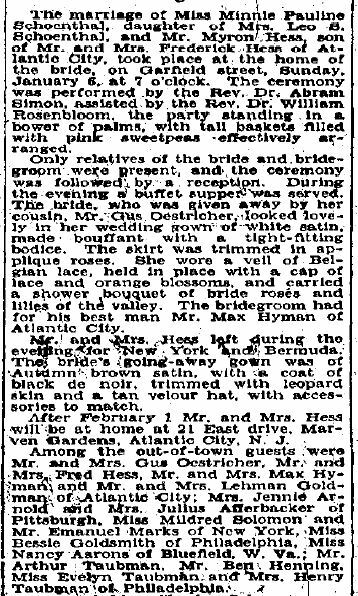 Minnie Pauline Schoenthal married Myron Samuel Hess on January 6, 1929, at her mother’s home in Washington, DC, on Garfield Street. The article below describes it as a small but elegant wedding attended only by the relatives of the bride and groom. So who were those out of towners named as guests at the wedding? Gus Oestreicher, who gave away the bride, was the husband of Sarah Stern, Hannah Schoenthal’s oldest child. Sarah was Minnie’s first cousin, once removed. Mr. and Mrs. Lehman Goldman were Flora Wolfe and her husband. Flora was the daughter of Amalie Schoenthal and also Minnie’s first cousin, once removed. Mrs. Jennie Arnold was also the daughter of Hannah Schoenthal and thus also Minnie’s first cousin, once removed. Mrs. Julius Afferbacker was, I believe, Mrs. Julius Averbach or Bernice Arnold, Jennie Arnold’s daughter, and thus Minnie’s second cousin. The others must either have been the groom’s relatives or Fannie Pach’s relatives or people I have not yet found. 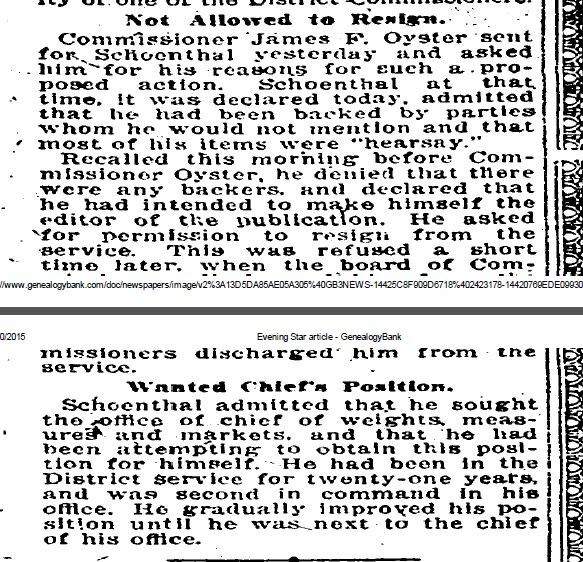 But even this small list gave me a sense of how connected the overall Schoenthal clan continued to be as of 1929. Jennie, Flora, and Sarah were my grandmother Eva Schoenthal’s first cousins as was Leo Schoenthal. Minnie was her first cousin, once removed. But it does not appear that my grandmother attended this wedding. Of course, by 1929 my grandmother had two young children and was living in Philadelphia and also had spent her childhood far away from the Schoenthal clan on the East Coast. Nevertheless, it is a bit sad that she and her parents were not at this wedding (or at least not included on the list reported in the newspaper). Minnie moved to Margate, New Jersey, near Atlantic City, after marrying Myron where he continued to work in the family photography business. They would have two daughters during the 1930s, and in 1940 they were still living in Margate and Myron was still in the photography business. Here is a photograph taken by Fred Hess & Son Photographers. Leo’s widow Fannie Pach Schoenthal took over Westminster Press after Leo died. On the 1930 census she was living alone in Washington, DC, and listed her occupation as president of a printing business. By 1940 she appears to have left Westminster Press; she was still living on Garfield Street, but now with five lodgers in her home. Her occupation was listed as a lodging house keeper. 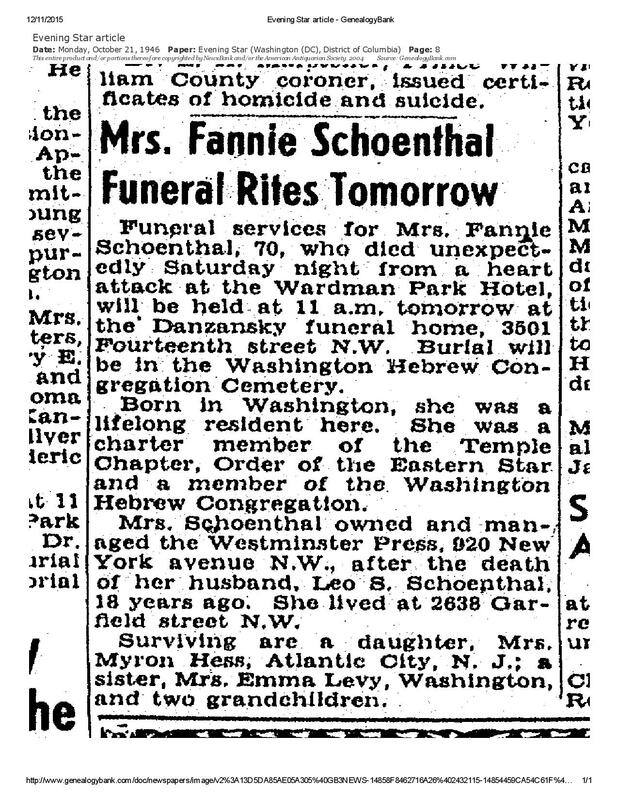 On October 19, 1946, Fannie died unexpectedly from a heart attack while she was at the Wardman Park Hotel in DC (a place I have stayed in Washington); she was seventy years old. Minnie Schoenthal Hess’s husband Myron died four years later on November 6, 1950, a month before his 52nd birthday. His daughters were just teenagers when he died. In 1955, five years after Myron died, Minnie remarried; her second husband was A. Jay Trilling, who owned a paint company. He died in 1983. Minnie lived to age 95, passing away on August 15, 1998. According to her obituary, she took over Myron’s photography business after he died. TRILLING, HESS, SCHOENTHAL, MINNIE, who came to Margate as a bride in 1929 and lived in the same house in Marven Gardens for sixty-five years, died at Manor Care Nursing Home in Potomac, Maryland, on August 15, after a long illness. She was 95. Mrs. Trilling was born in Washington, D.C. and moved to Atlantic City when she married Myron Hess. She took over as head of Fred Hess & Son Photography Studio following the death of Mr. Hess in 1950. In 1955 she married A. Jay Trilling, president of Trilling Paint Co. and former president of the Greater Atlantic City Chamber of Commerce as well as president of Temple Beth Israel. He died in 1983. Mrs. Trilling served as president of the Women’s Division of the Chamber of Commerce, president of the Exchangettes, and she was a member of Soroptomist International, Beth Israel Sisterhood, Betty Bacharach Auxiliary, and the Ladies’ Auxiliary of the Children’s Seashore Home. She was a member for 77 years of the Order of the Eastern Star. Mrs. Trilling was especially proud that she was responsible for the beautification and restoration of Marven Gardens in the late 70’s. Thus, both Minnie and her mother Fannie became widows at a young age, and both took over their husbands’ business after their husbands died. They were not only survivors; they were women who took on the responsibility of running a business to support their families. Rose died almost ten years later on January 23, 1951. She was 74. Rose and Joseph had not had any children, so there were no descendants. When Rose died, she had already lost not only her parents and her husband, but also all three of her brothers and at least two of her sisters-in-law. There seemed to be a fair number of “sudden” or “unexpected” deaths in the family. More on the younger two brothers in my next post. 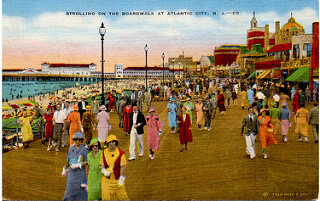 This entry was posted in Genealogy, Schoenthal, Washington and tagged atlantic city, leo schoenthal, Photography, schoenthal, Washington DC by Amy. Bookmark the permalink.